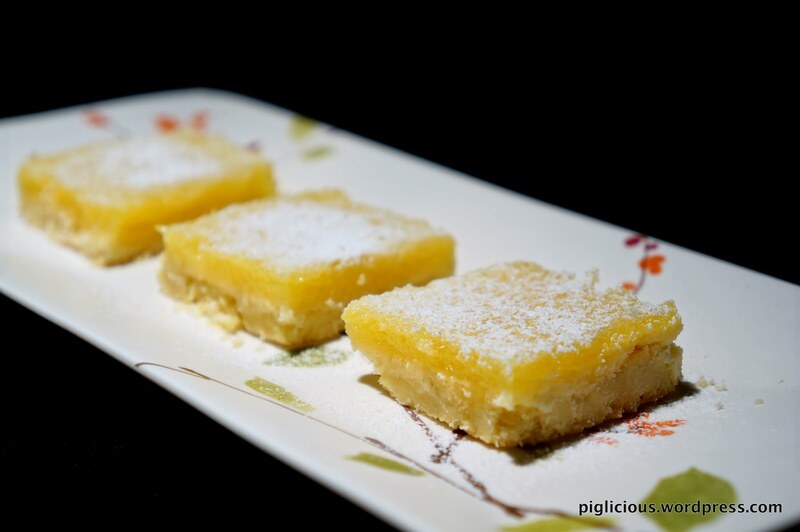 Ever since last Christmas, I’ve become obsessed with lemon bars. My roommate had made them for a family gathering and I had the opportunity to try some. 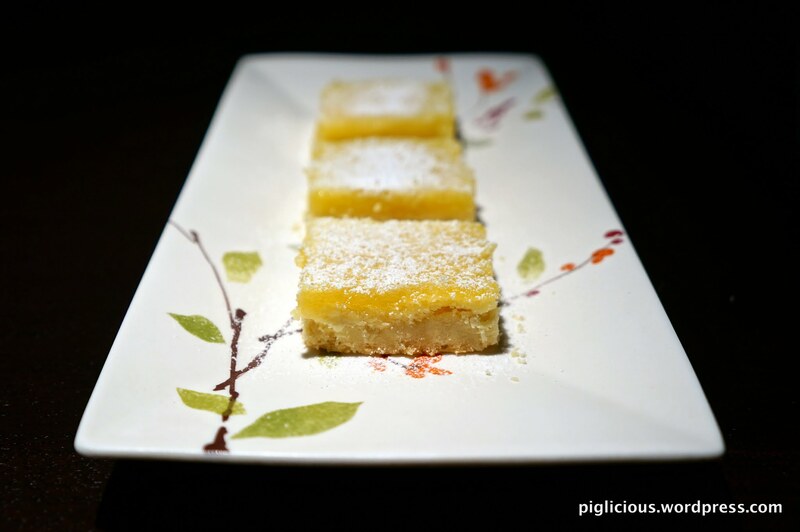 I’ve never really liked lemon bars until I had these. They were tart, not too sweet, and absolutely delicious. She had followed this recipe (minus the walnuts). 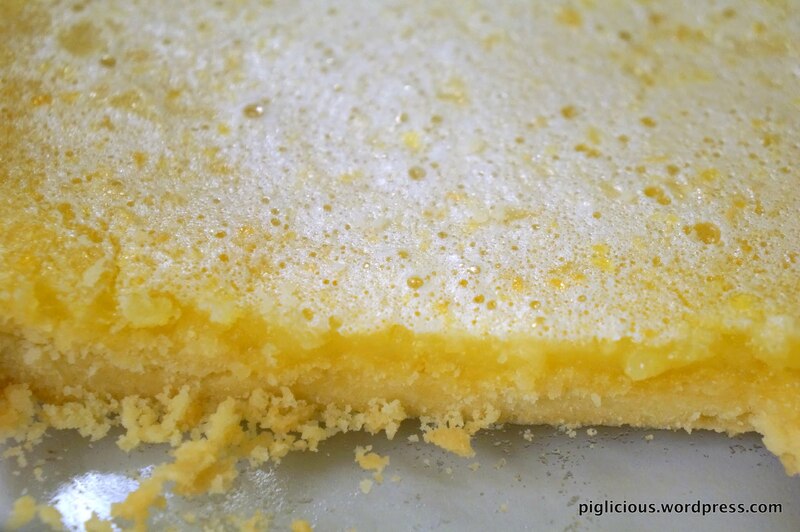 I followed the same recipe to make my own batch with high expectations, but to my disappointment they didn’t turn out the same–The crust was thicker, the filling was thicker and more gooey, and the lemon flavor wasn’t as tart. Apparently, my roommate had tweaked the recipe but had forgotten what was tweaked exactly. 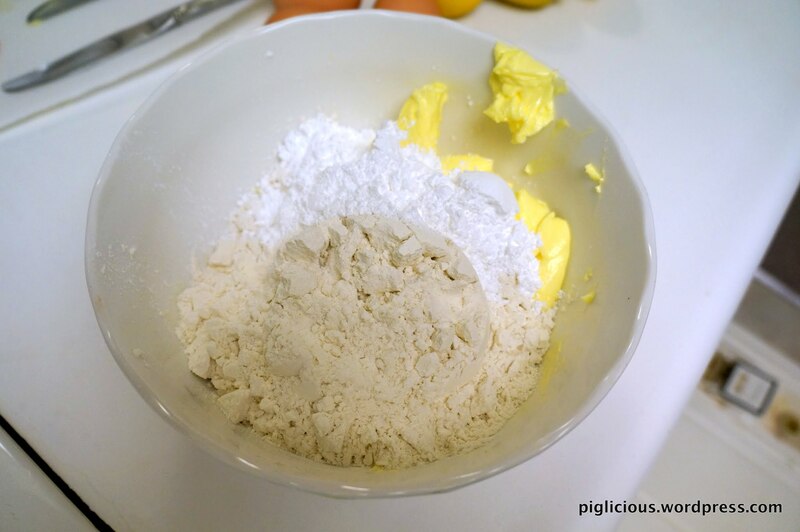 So for the next several weeks we experimented by adjusting the servings of the recipe and then increasing the amount of lemon juice, adding lemon zest, and added more flour for the filling. Between the two of us, we probably made about 7 batches until we figured it out. Thanks to the help of my roommate, here is the final tweaked recipe! 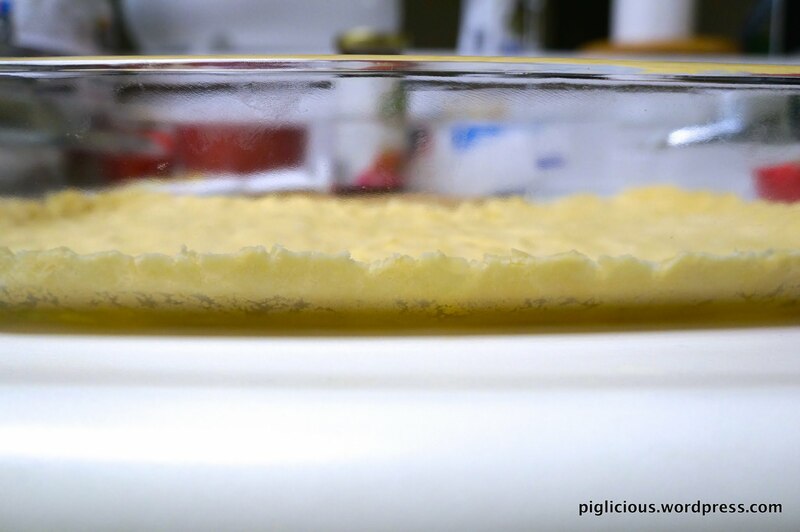 Melt the butter a little in the microwave for 15 secs. Then add in the powdered sugar and flour. 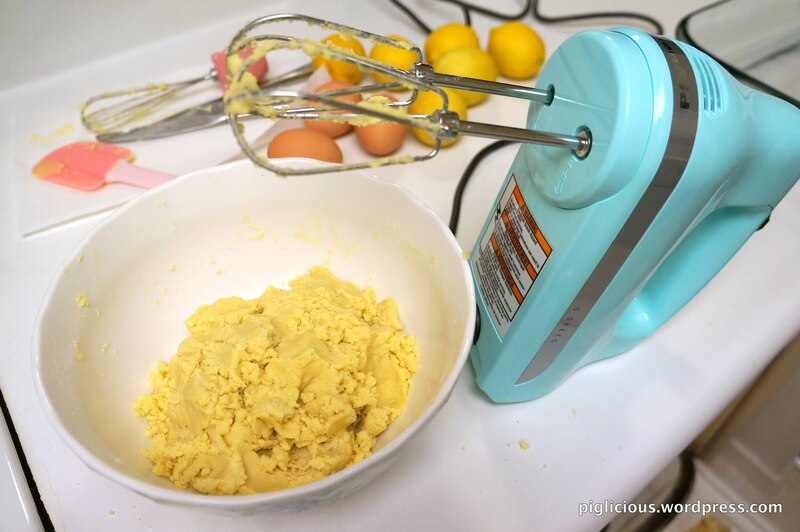 Mix with a hand mixer on low speed until you see clumps form. Mix for about 2 mins longer, or until thoroughly incorporated. Then take the clumps and pack them together with your hands. 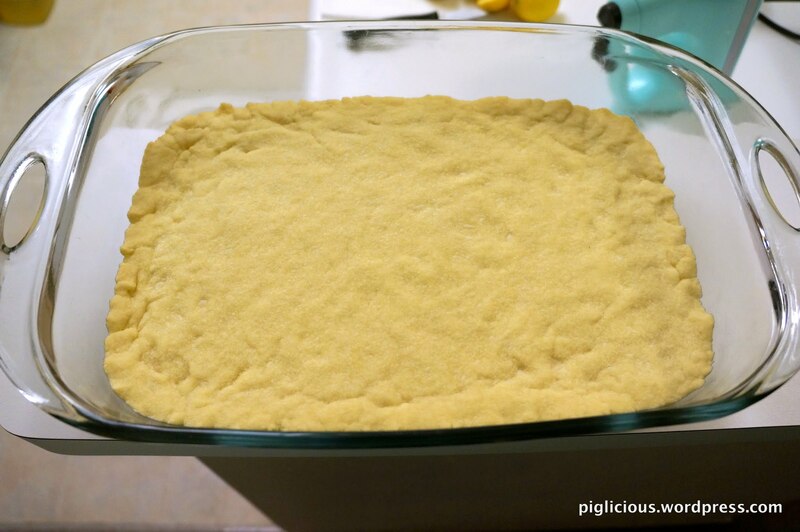 Place the crust dough in a 9×13 pan. 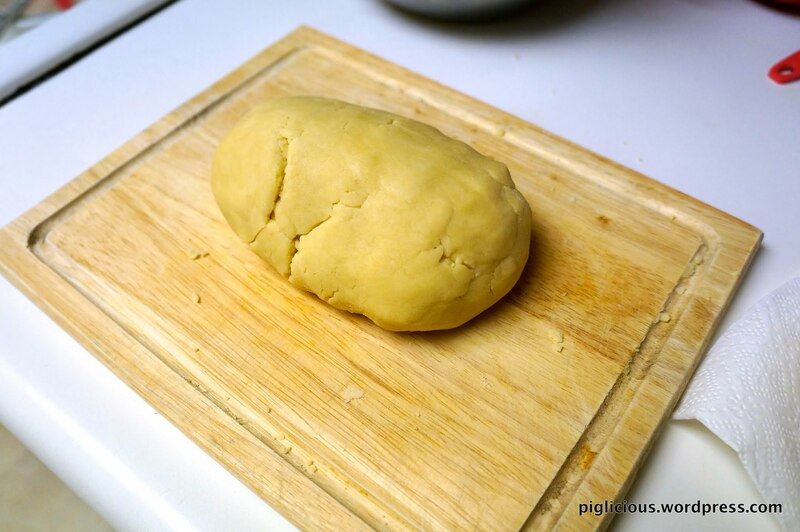 Spread the dough out evenly with your hands, packing it down in the process. 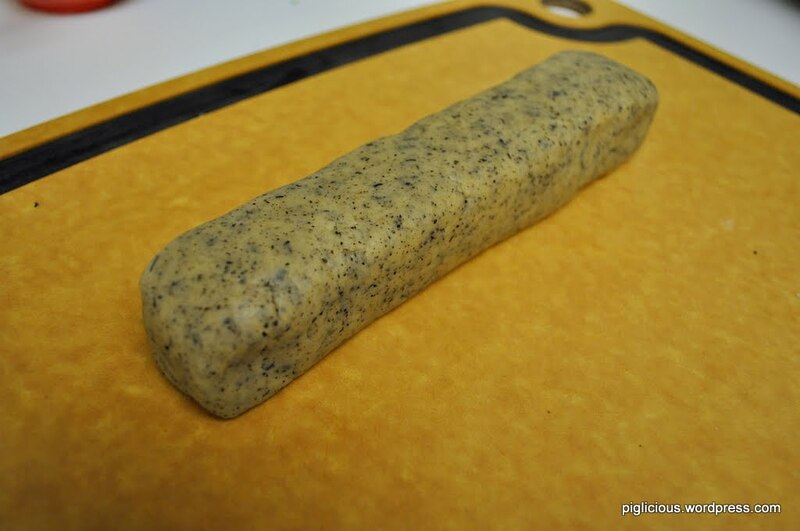 Bake for 18 mins, or until edges are very light brown. While the crust is baking, prepare the filling. 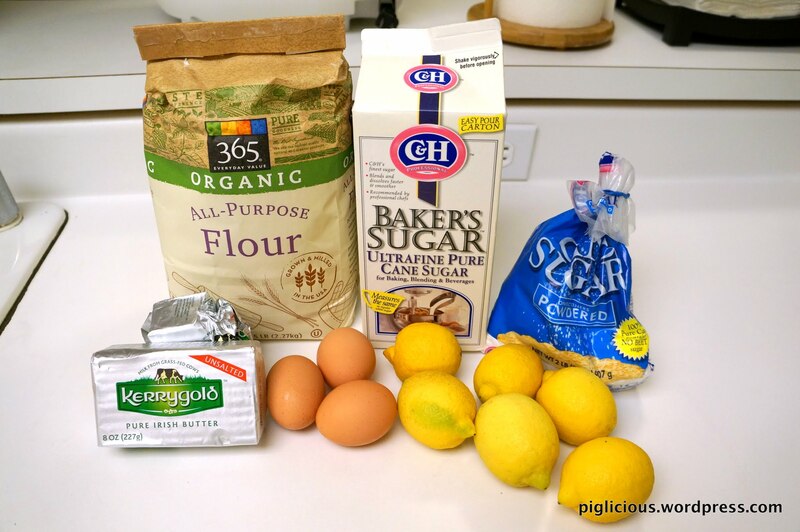 Squeeze the lemons to make the 1/2 cup of lemon juice. 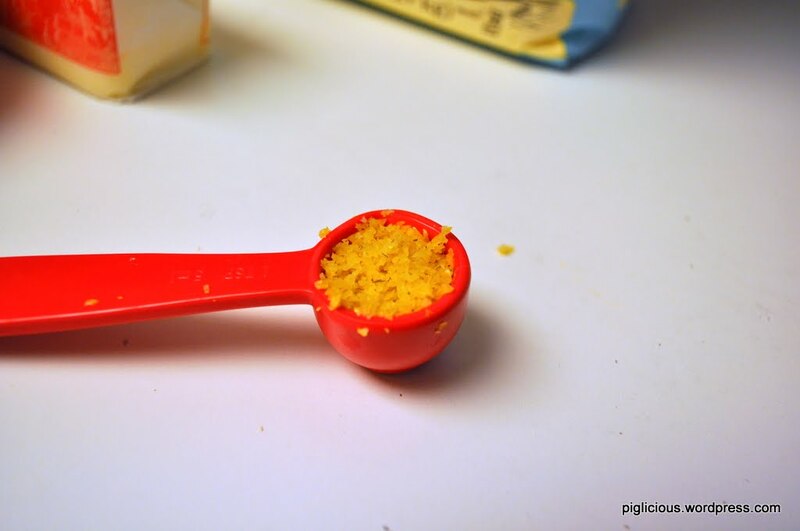 Zest the lemons to loosely measure 1 tablespoon. 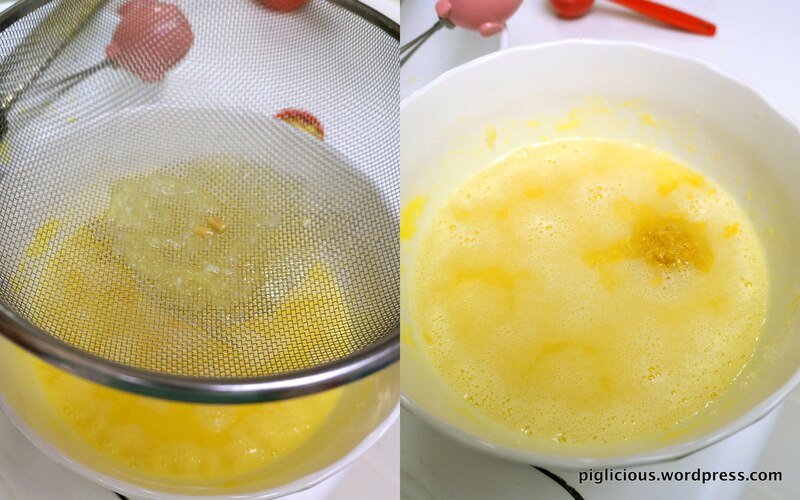 Place the egg and sugar in a large bowl and mix with a whisk. 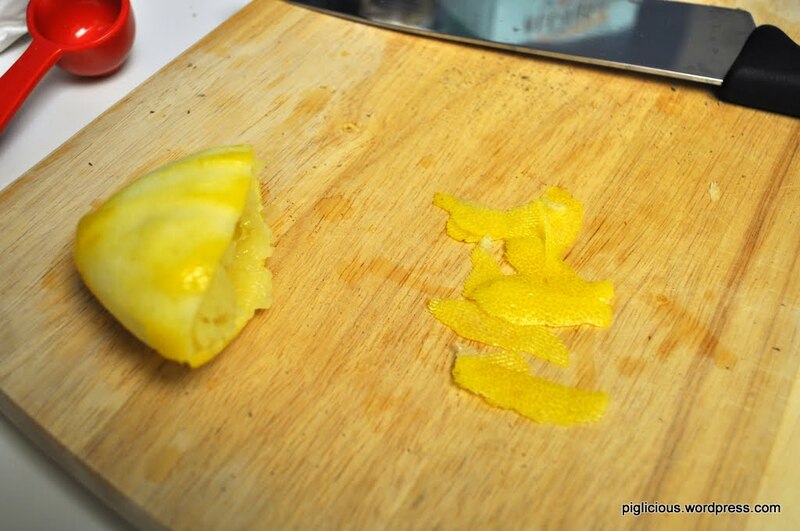 Strain the lemon juice to get rid of any seeds and pulp. (I like it more tart, so I add the pulp back in). 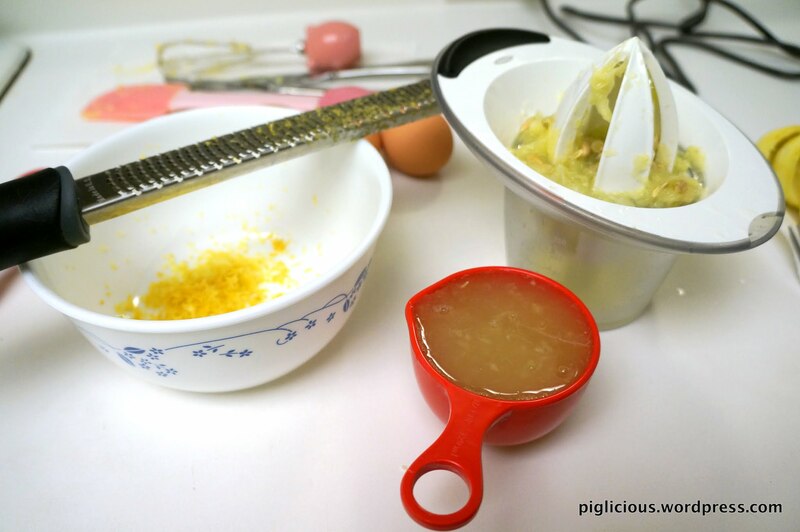 Add in the lemon zest and mix. At this time, your crust should be just about done. Take it out of the oven and let it cool for about 5-7 mins. 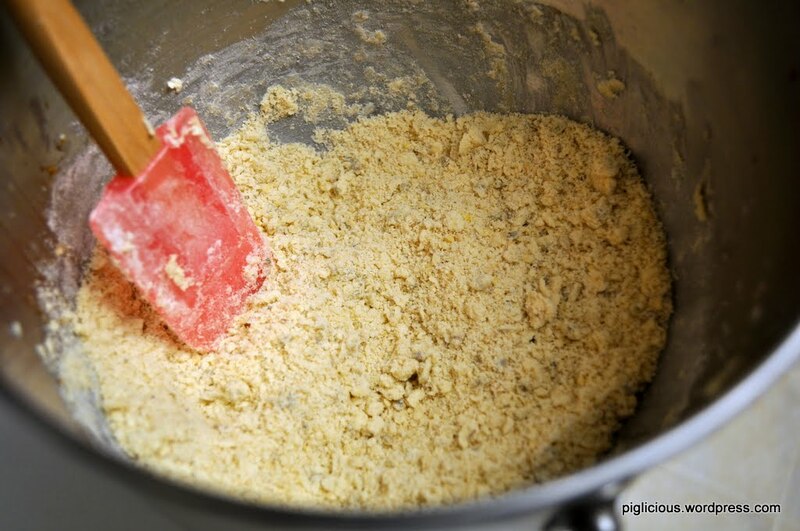 While the crust is cooling, sift and add the flour in small amount while stirring into the filling mixture. 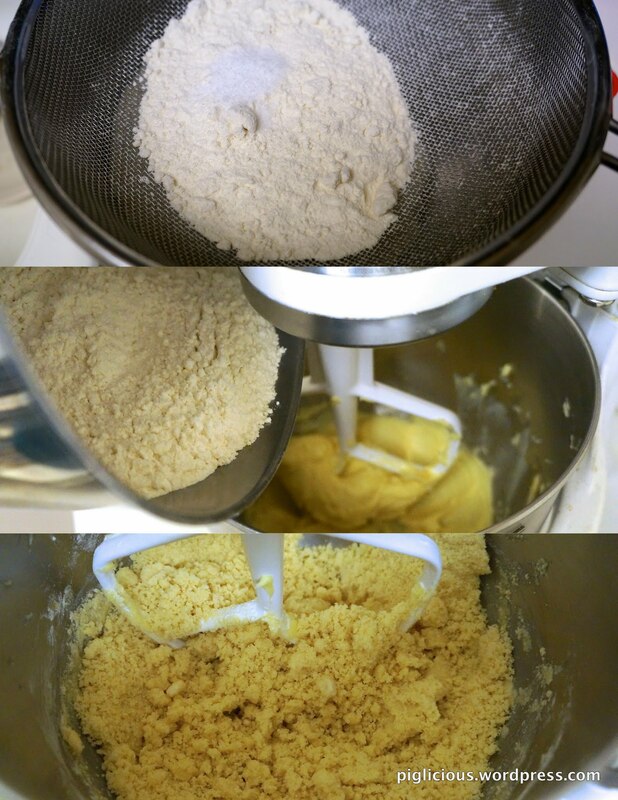 Make sure there are no clumps of flour floating in the mixture. 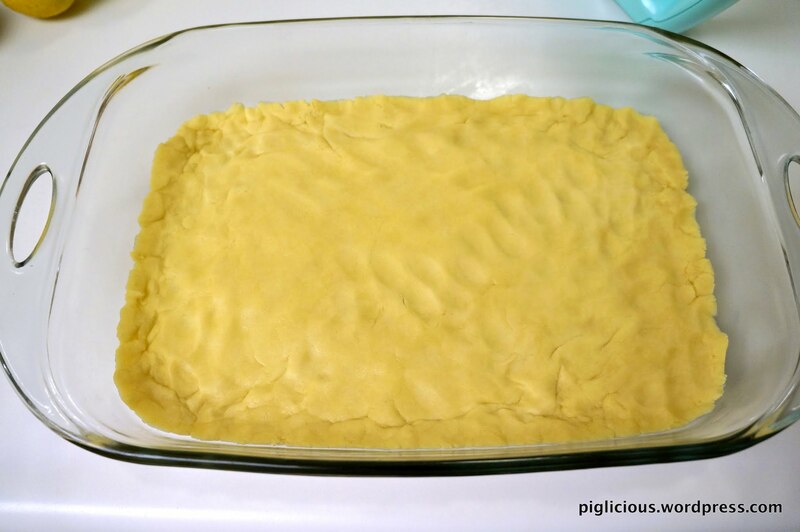 After the crust has cooled for a little bit, add the filling onto the crust. Pop any air bubbles on the surface. Bake for 23 mins. 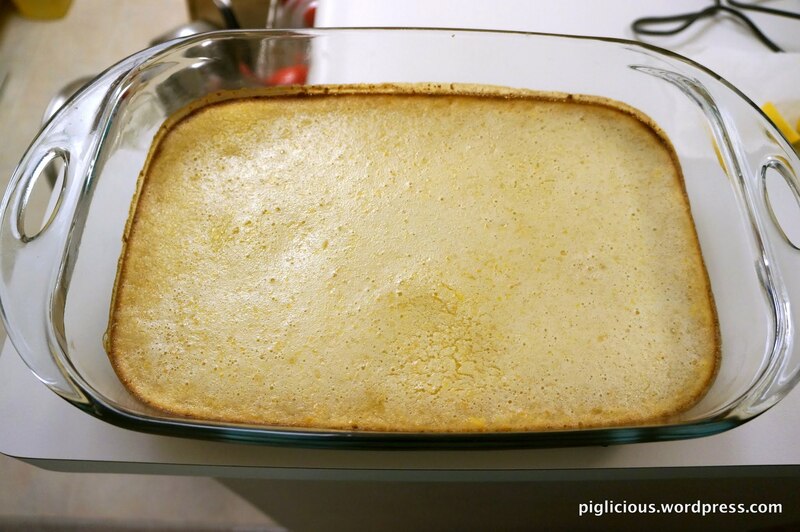 The edges should be brown when you pull it out of the oven. Let it cool for about 1 hour before cutting into it. A closeup of the filling and crust. 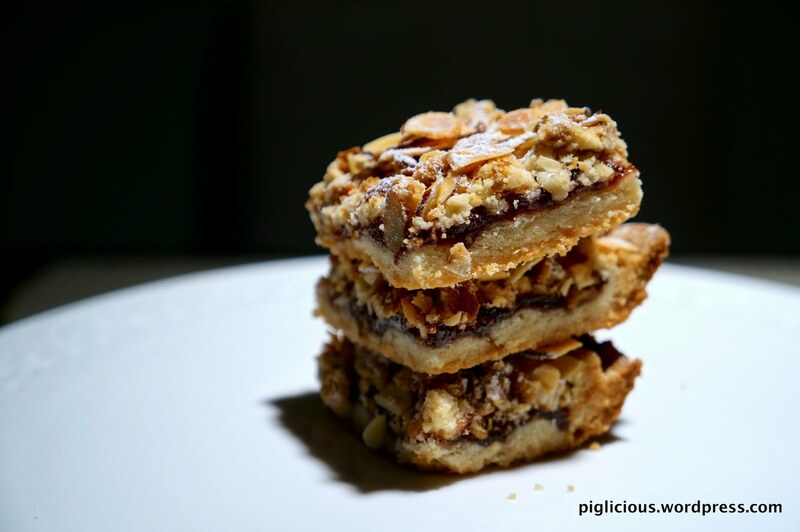 Cut them into squares, and Enjoy these delicious bars!! 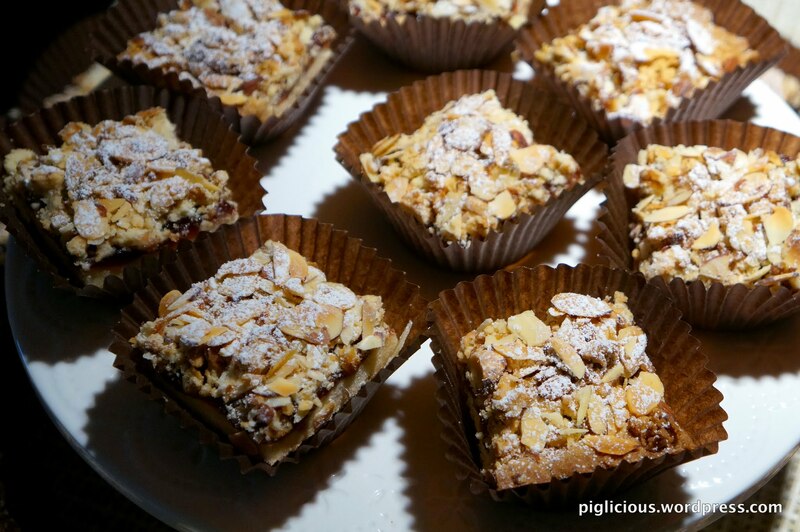 About a year ago, one of my coworkers had made and shared these crumble bars with us. I loved it so much that I asked her to share her recipe and she told me she had simply followed this barefoot contessa recipe and added a little more sliced almonds. Super simple, she emphasized. Since then, I’ve made them a couple of times and eventually tweaked it to my liking: the less sweet and less buttery version. 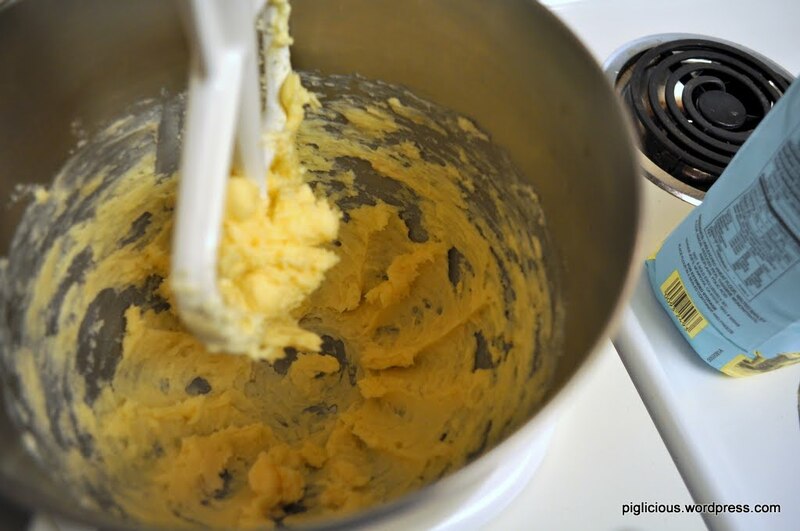 (I reduced the sugar to 78% and butter to 88% of what the original recipe called for, so if you feel that either of them is not enough for your liking, you could always add a little more of each). 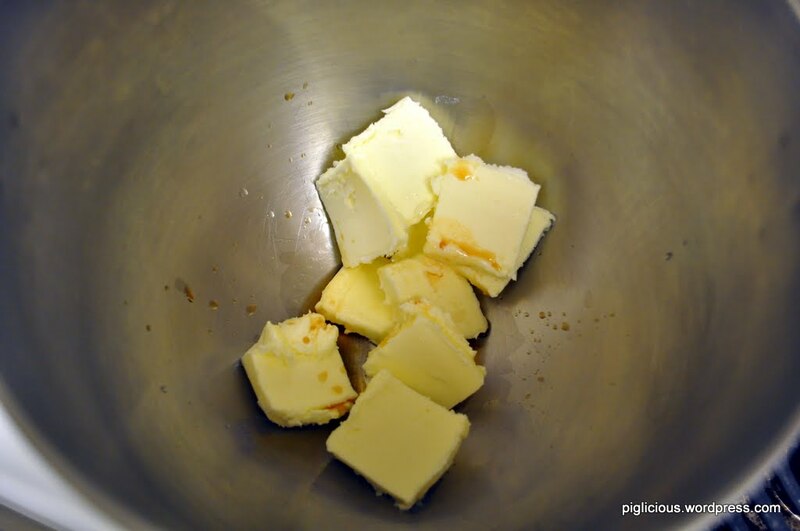 Place the butter and sugar in the electric mixing bowl. Use the paddle attachment and mix on medium speed just until combined. Then add the vanilla extract and mix on low speed until combined. 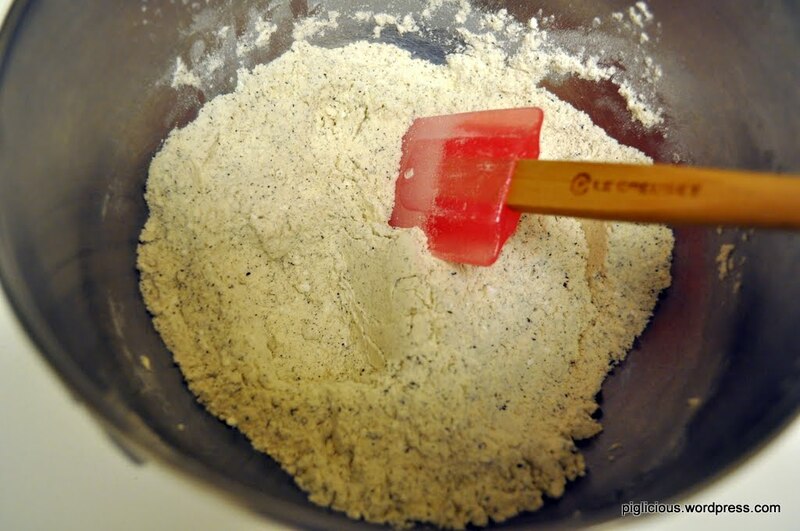 In a mixing bowl, sift the flour and salt together. Slowly add this to the electric mixing bowl with the mixer on low. 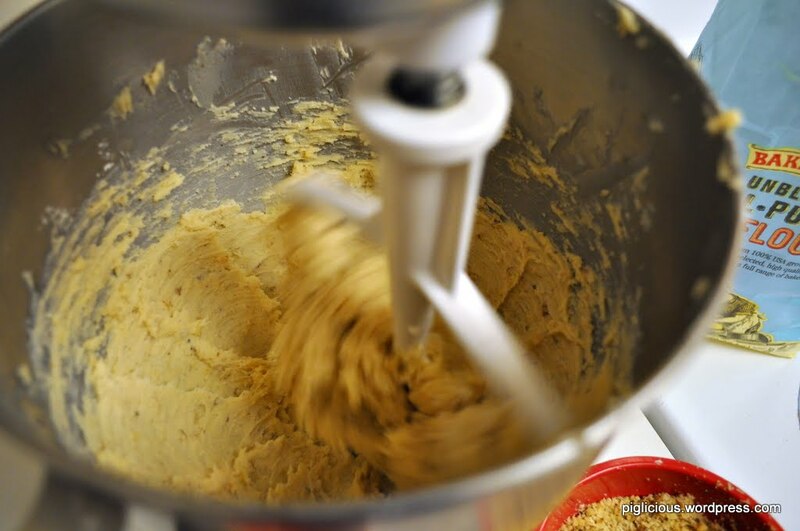 When they are combined, take it out of the mixer and use your hands to press the crumbly dough into a ball. Turn the dough out on a board. Lightly pat 2/3 of the dough evenly on the bottom of a 9 inch by 13 inch glass oblong baking dish and about 1/4 inch up the sides. Spread with the jam, leaving a 1/4 inch border. 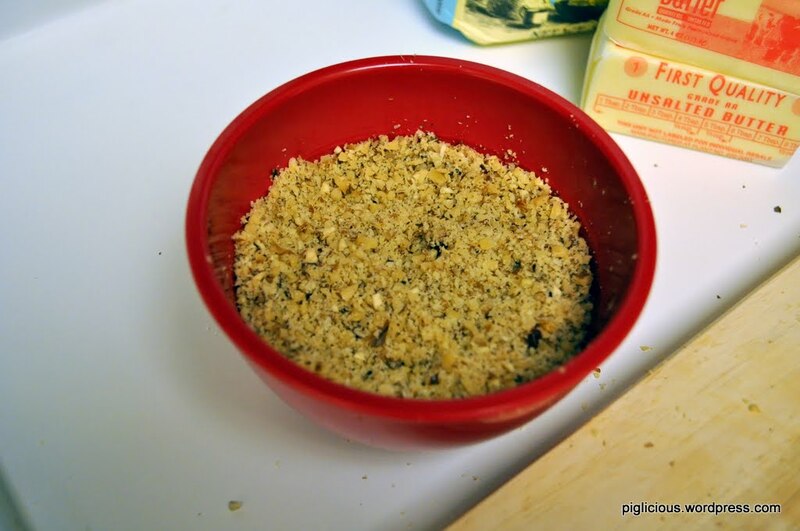 Mix the granola into the remaining dough with your hands. 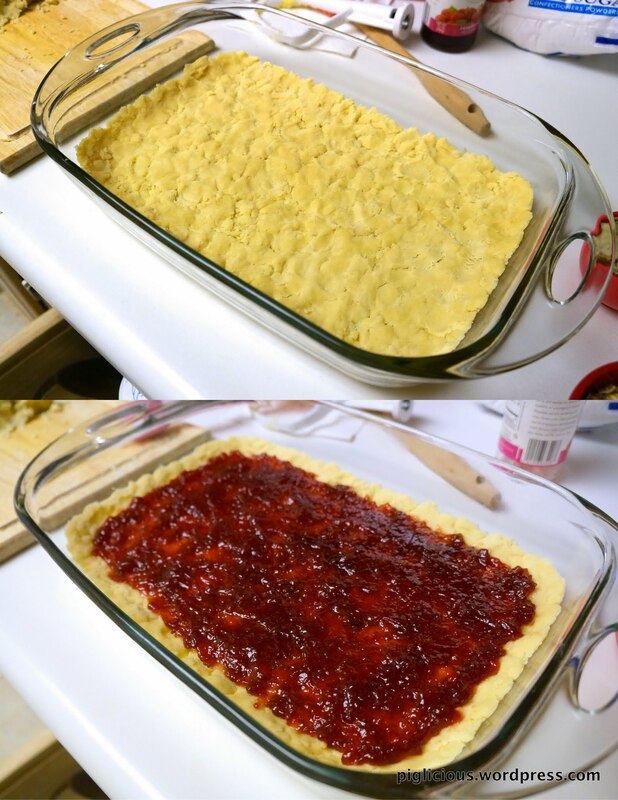 Break the dough into small bits, and distribute it on top of the jam, covering most of the surface. (I didn’t end up using all of this since I didn’t want it to be too thick). 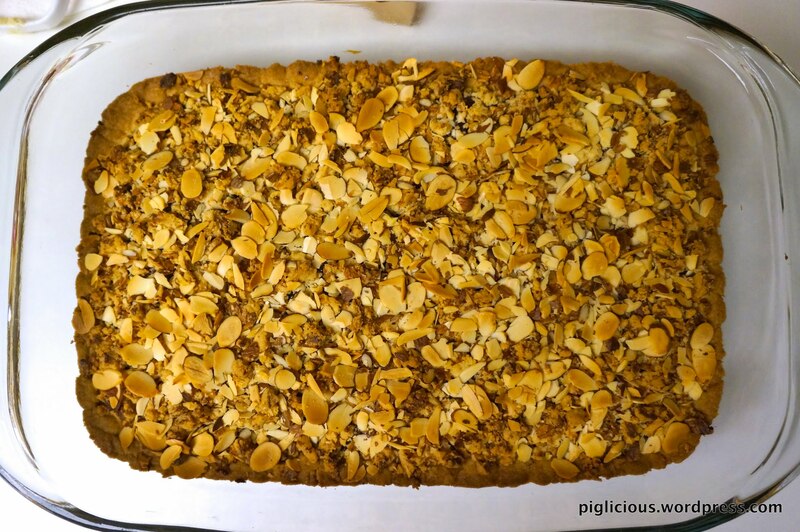 Sprinkle the almonds on top. 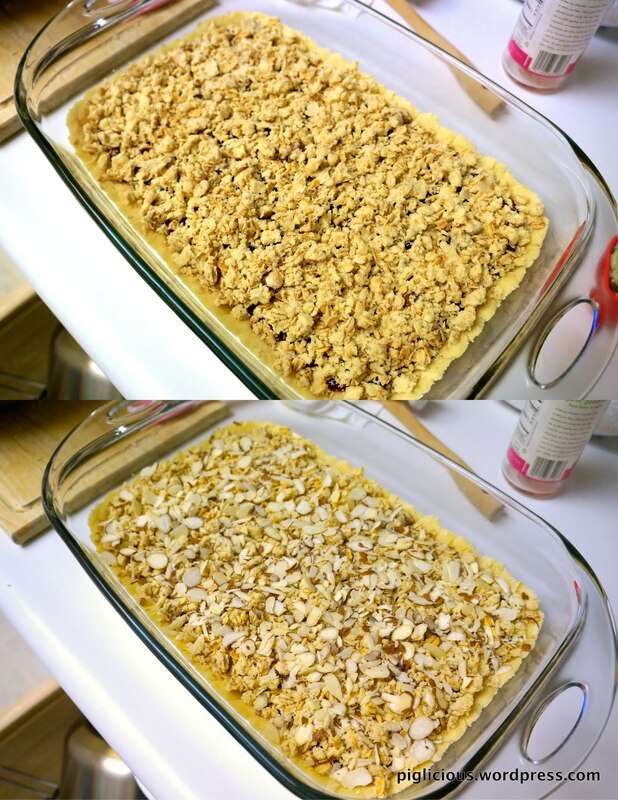 Bake the bars for 45 minutes, until lightly browned. 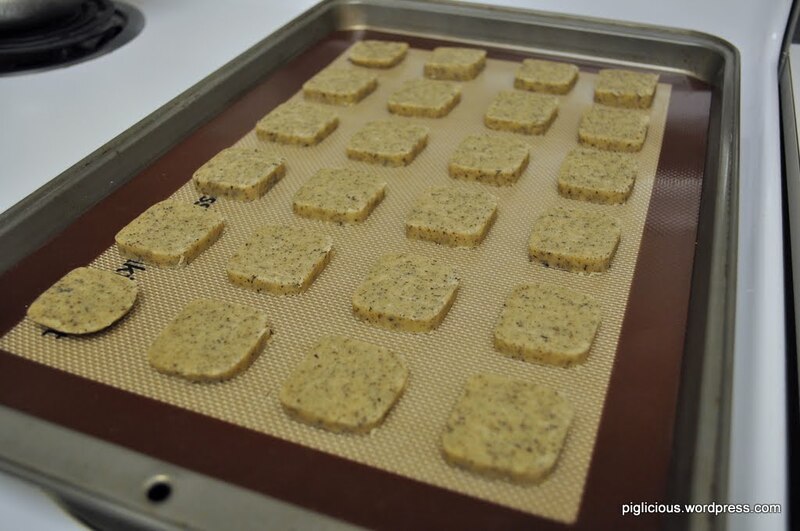 I’ve always wanted to make lavender cookies, so I experimented by changing a few things from the earl grey tea cookies recipe. They turned out surprisingly well! *The brown sugar to confectioner’s sugar ratio is 1:1. 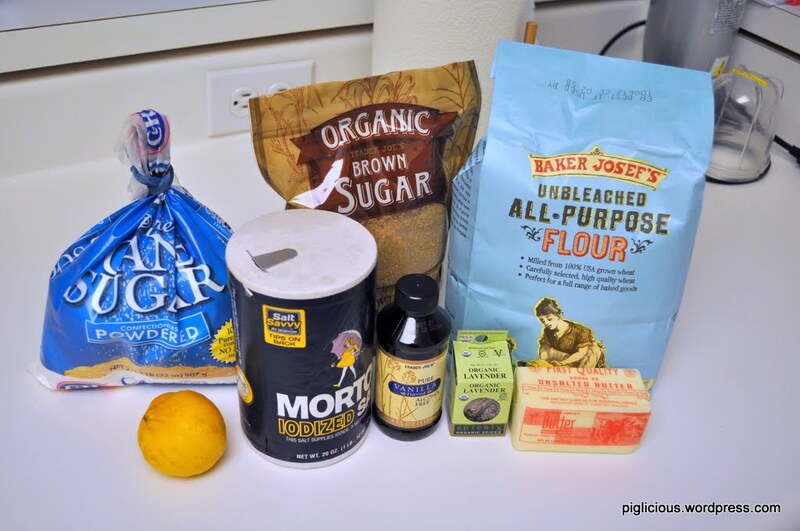 I use a little more than 1/8 and a little less than 1/4 cup for the brown and confectioner’s sugar. For the lavender, finely chop them with a knife. 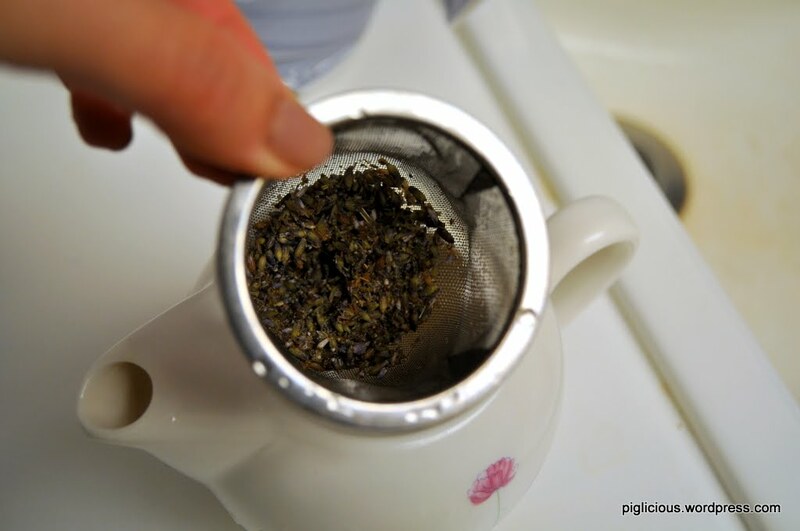 I wanted to infuse the fragrant smell and flavor of the flower more in the cookie, so I came up with the idea of straining the flower first: Place all the chopped lavender in a tea strainer, boil some water and strain it once. Empty the water in the tea pot and let it sit/dry a little while you prepare the other stuff. 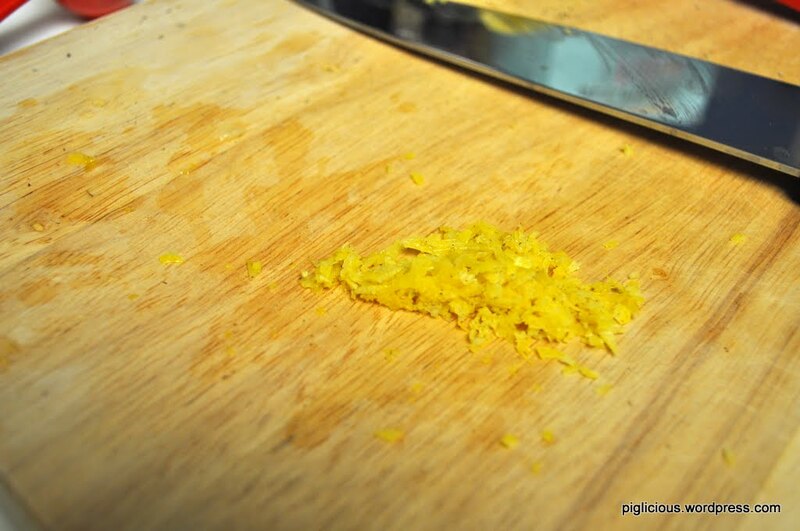 For the lemon zest, I peeled the lemon and used a knife to chop the skin into very fine pieces. 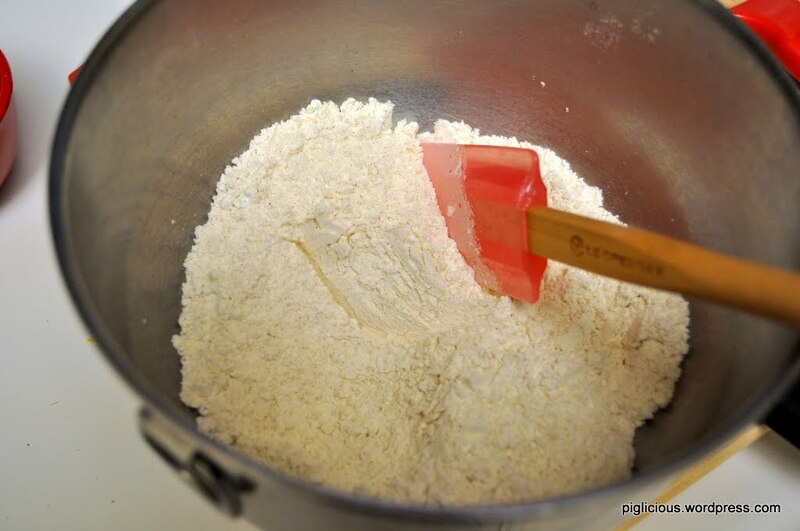 In a medium mixing bowl, mix the dry ingredients (flour, sugars, salt) together with a spatula. 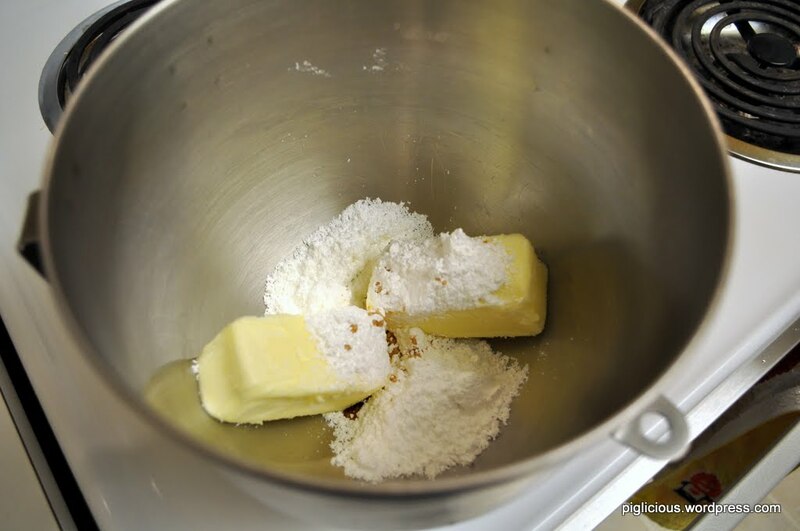 Make sure to smooth out any sugar clumps and mix evenly. 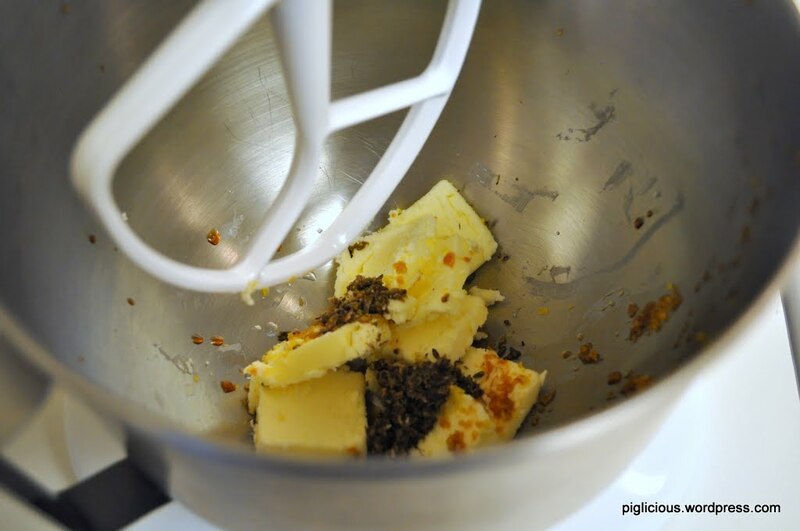 Mix all the wet ingredients (butter, lavender, lemon zest, vanilla extract, water) in the stand mixer’s mixing bowl. (level 2/3) Mix this well. 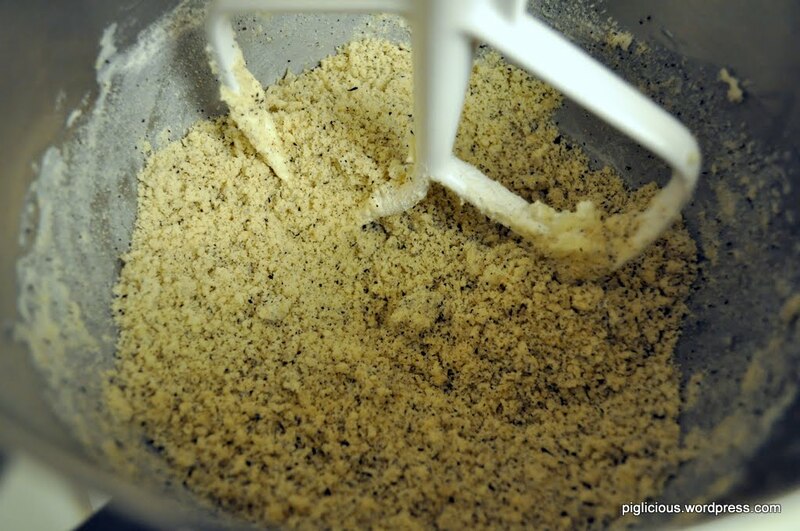 Add the dry ingredients to the wet and mix at low speed (level 1/2) for a few minutes. Then turn it up to low medium (level 2/3) for a couple minutes. 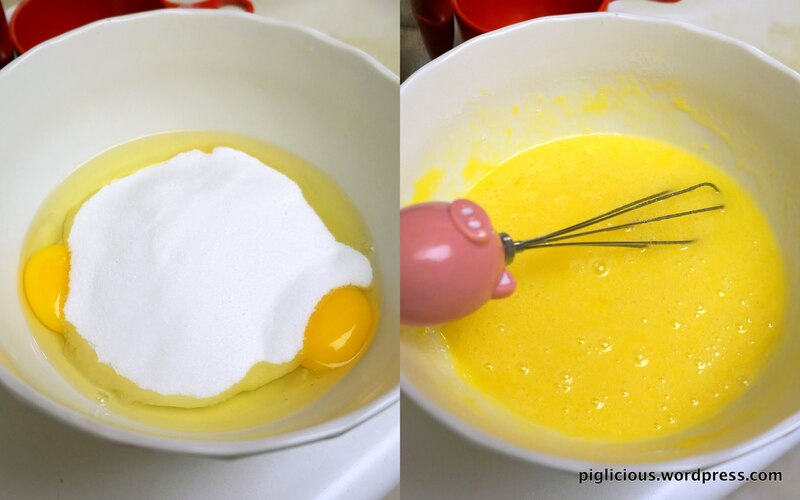 Stop occasionally to make sure everything stuck at the bottom and on the spatula is mixed in. Once it looks like the picture below, you can stop. Use your hand and press all the little clumps together to form a mound. 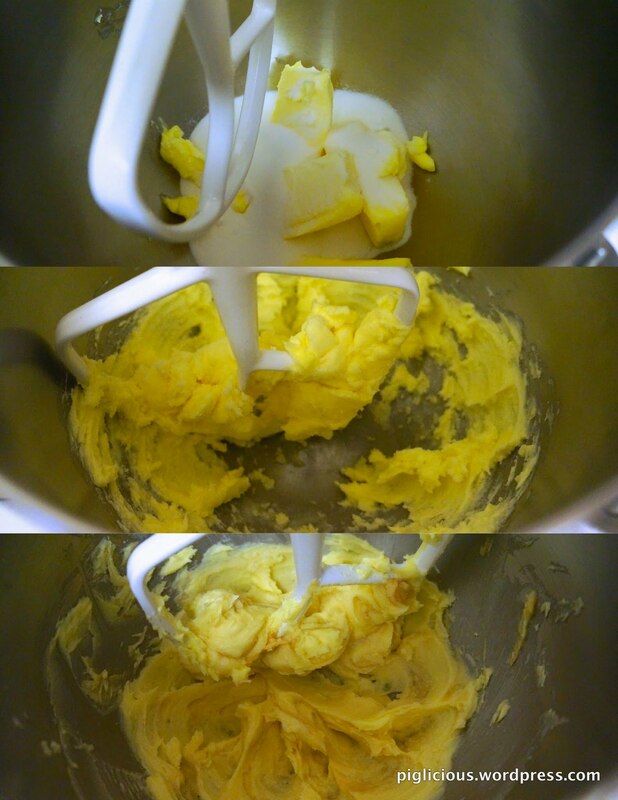 It’s a little difficult at first, but once your hand starts to semi melt the butter, it becomes more cohesive. 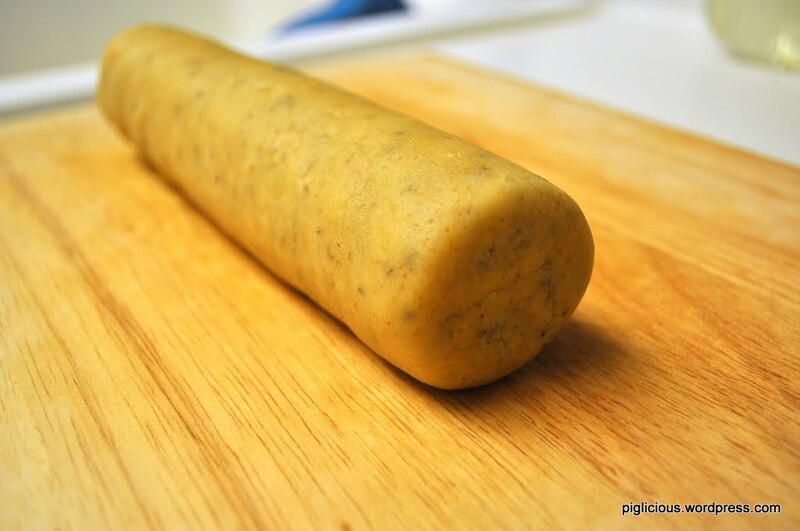 Take it out of the mixing bowl and mold it into a packed circular log. Feel free to slap/pound it a little to pack it together very well and then roll it for the circular shape. 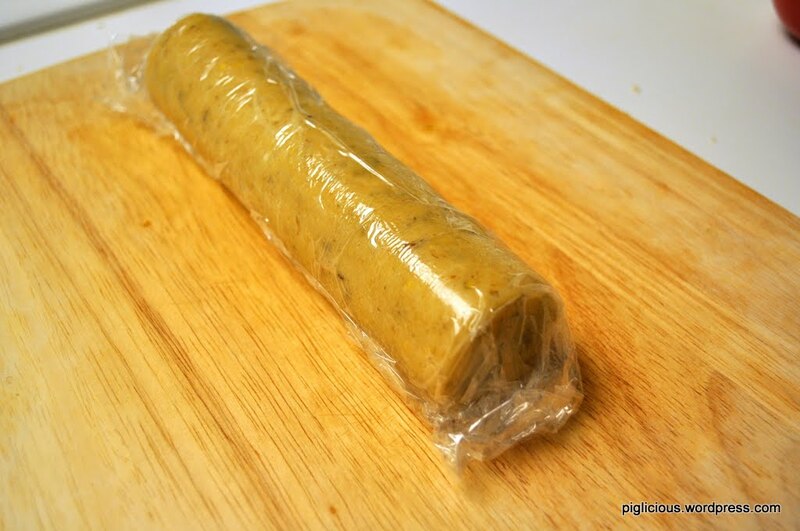 Once molded into shape, use saran wrap to completely cover the log and smooth out the surfaces. 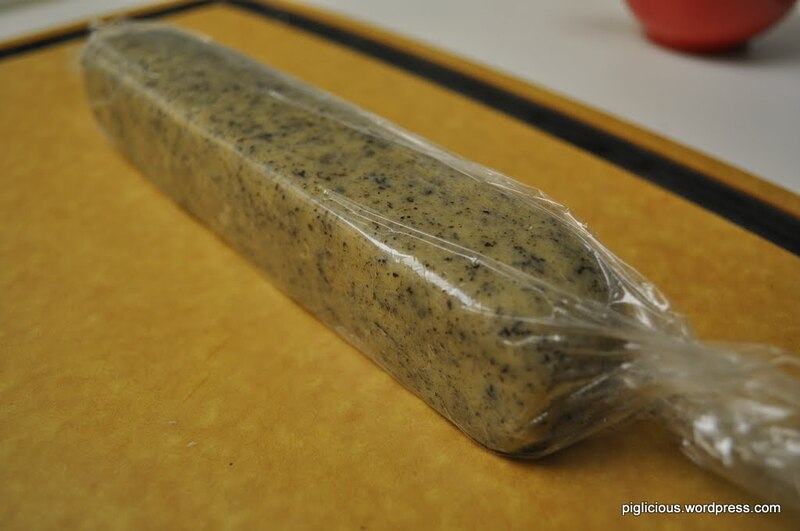 Place this in the freezer for 40 mins. 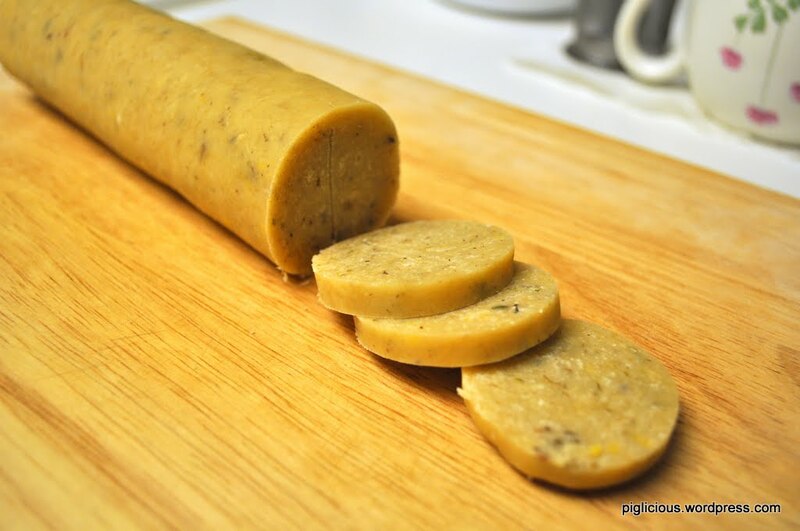 Freezing the log solidifies it and makes it easier to hold its cookie shape when it is sliced later. Slice cross section pieces that are about 1/4 to 1/3 inch thick. 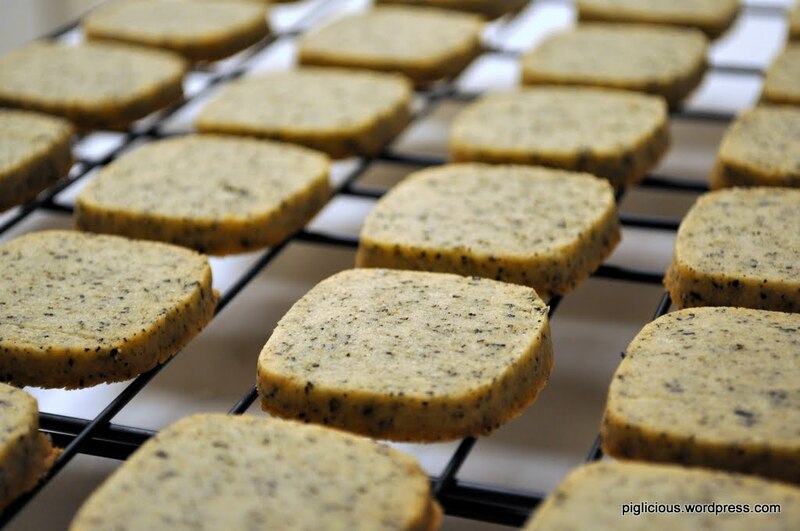 Place the slices on a silpat on a cookie sheet. 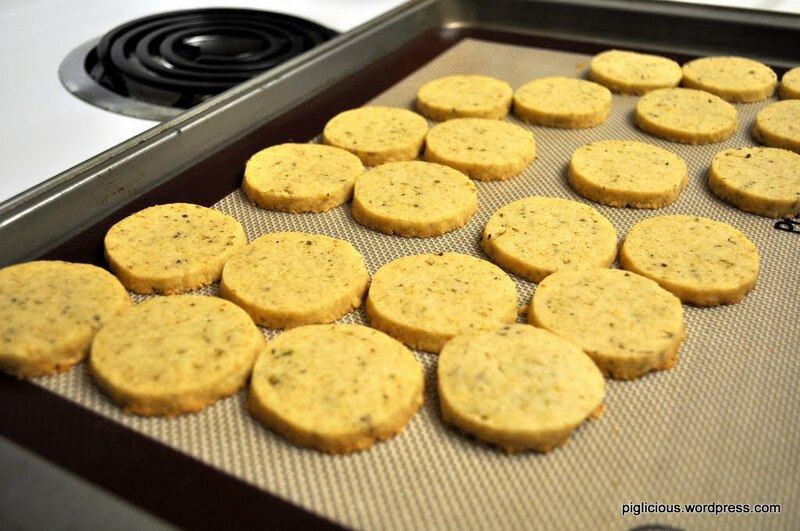 Bake for 10-12 mins or until the bottom edges are light brown. Let it cool for 10 mins on the silpat. 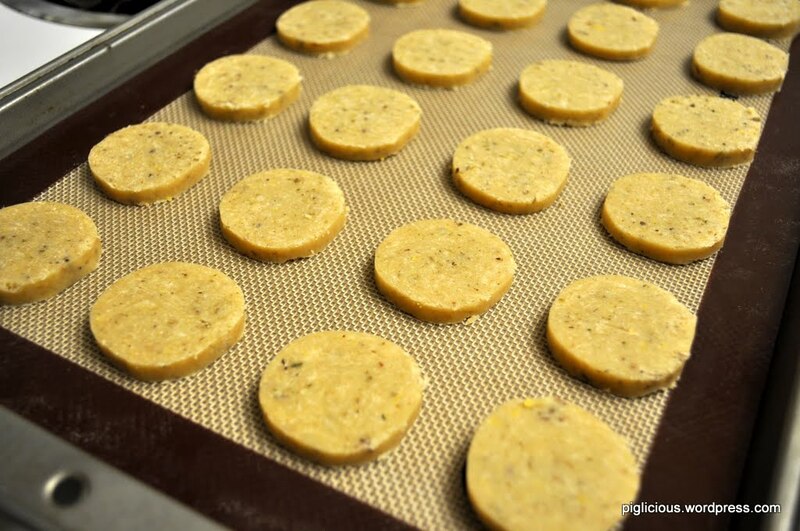 Place them on a cooling rack. Cool for 30 mins to 1 hr. Someone at work had brought in some mexican wedding cookies and they were so good. It triggered me to find a recipe and try to make them myself. I followed this recipe. It calls for pecans, but I used walnuts instead. They do require a good amount of butter, but it turned out not too overpowering in the cookies. Finely chop the walnuts with a knife. 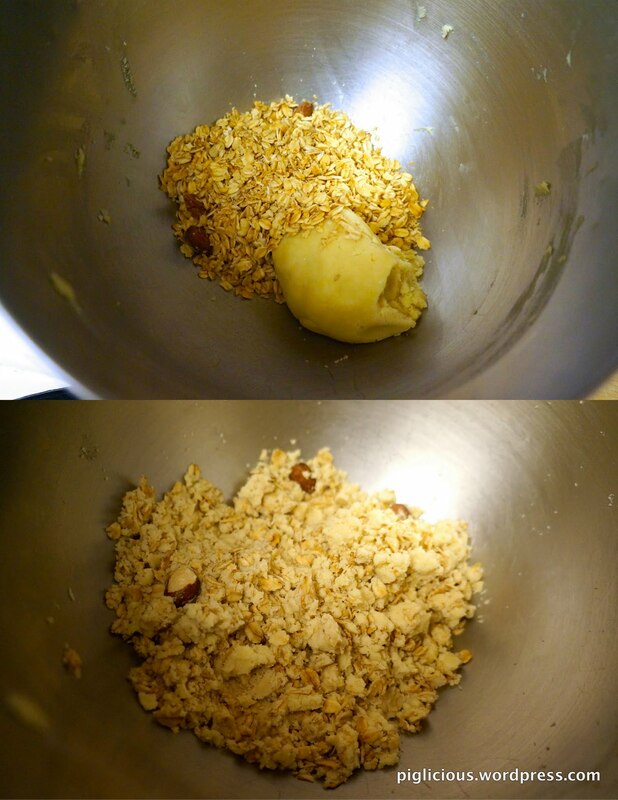 I tried using a food processor at first, but it cut and ground up the nuts too much. 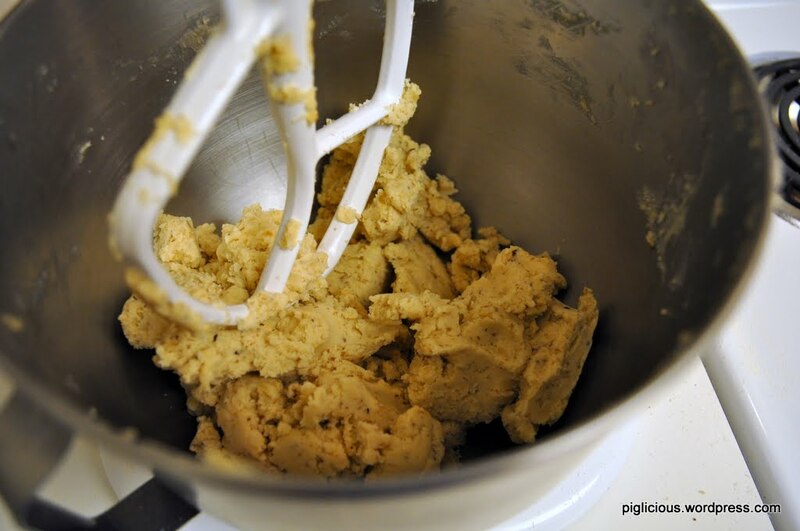 I’d rather taste the pieces of walnuts in my cookie than have a walnut flour cookie..
Use the paddle attachment and mix at level 3/4 (medium) until light and fluffy. 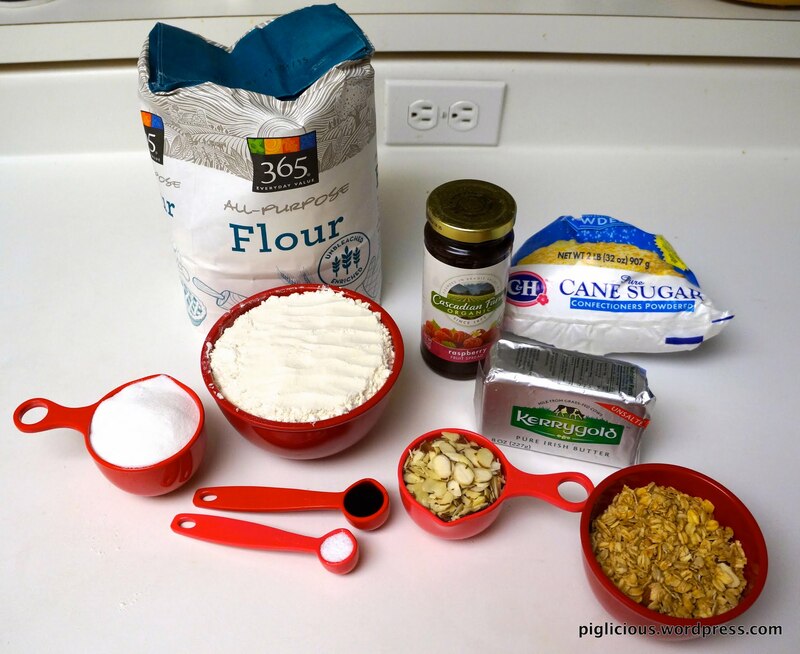 Gradually add the flour and walnuts. 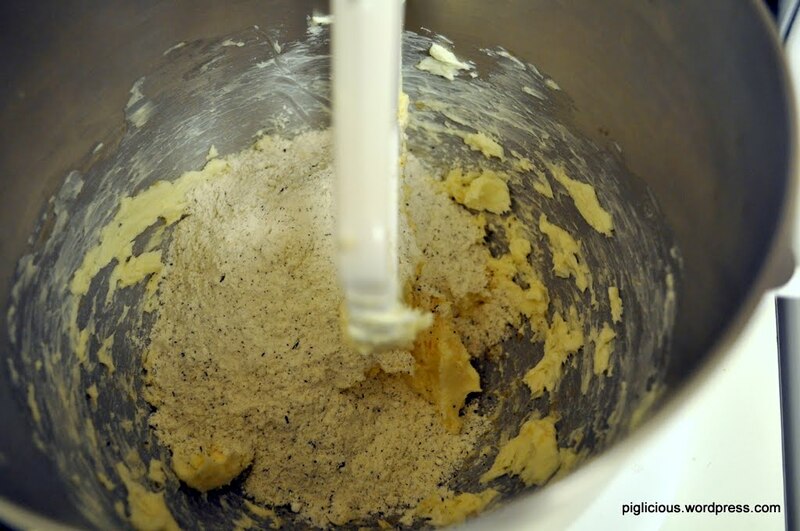 Mix at level 2 (low speed) after each addition until they are well blended. 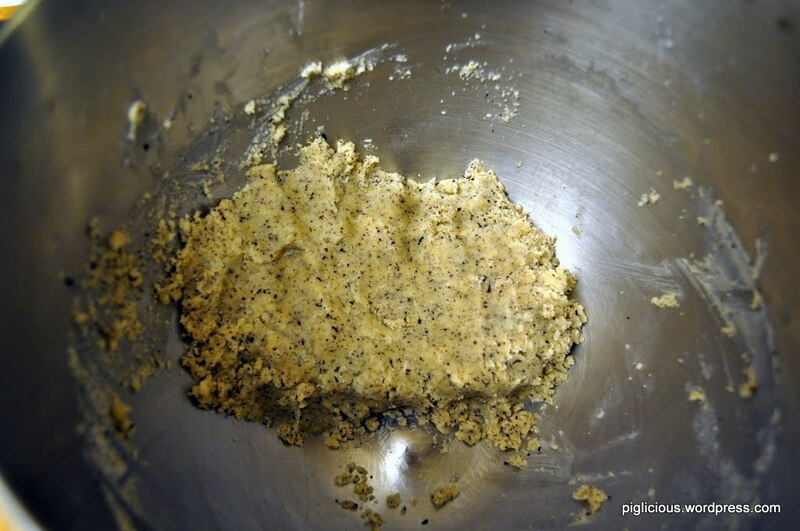 The dough should eventually look like this. 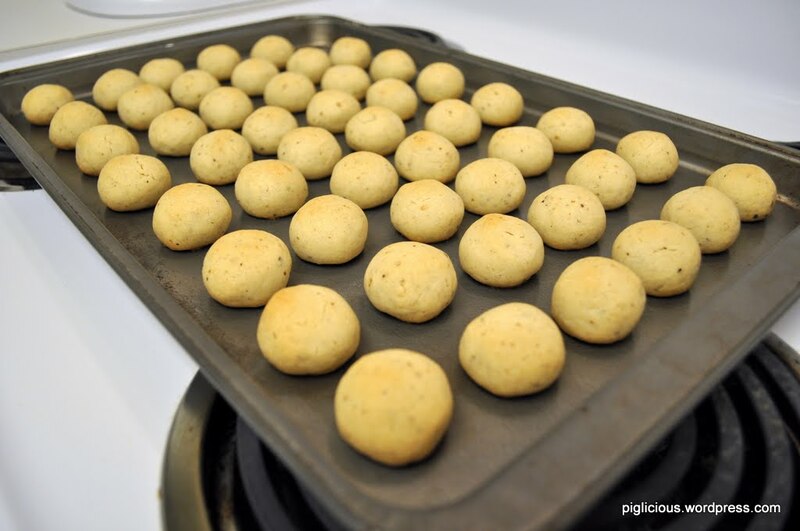 Make 1-inch balls with the dough and place them about 1 inch apart on an ungreased baking sheet. I placed them closer because I wanted to fit all 50 cookies on one baking sheet. It wasn’t a problem because the cookies dont flatten and get in each other’s way. 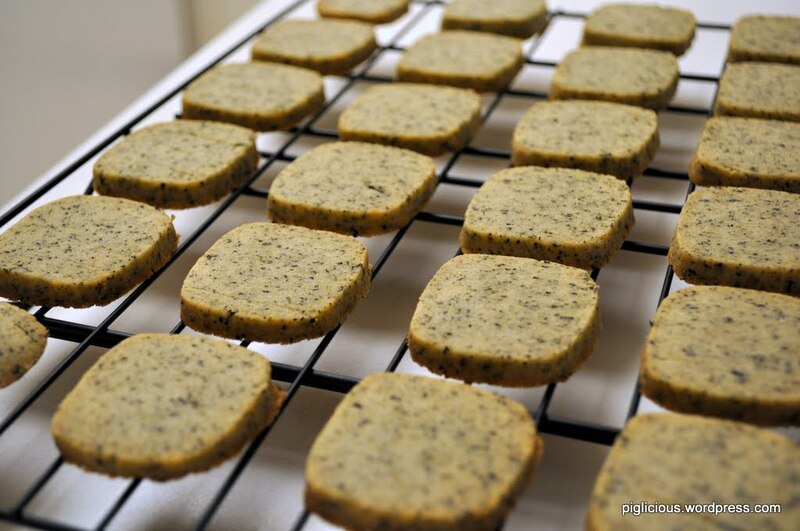 Bake for about 16 mins or until bottoms of the cookies are light brown. Cool 10 mins on baking sheet. *This part was the most difficult for me. 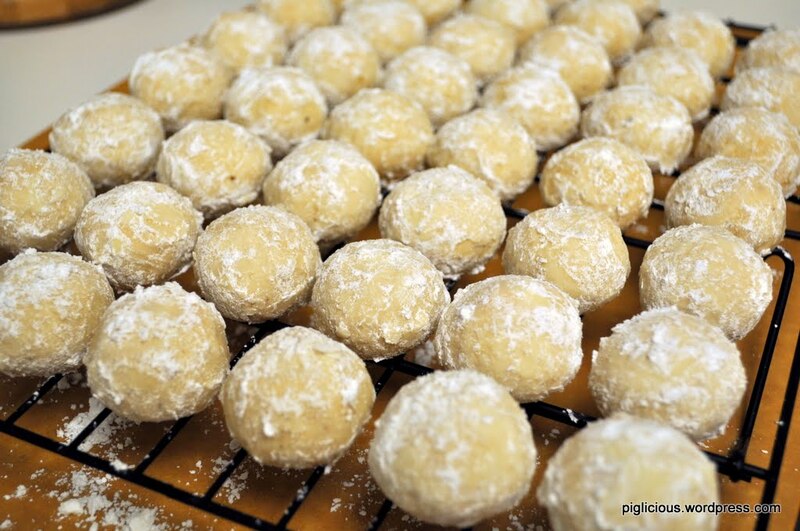 It was hard to acheive the powdered soft look since the powdered sugar kept melting on the cookie. You actually want some sugar to melt on it a little, but not too much, which is the tricky part. You also don’t want to put too much sugar coating that the cookie turns out too sweet. 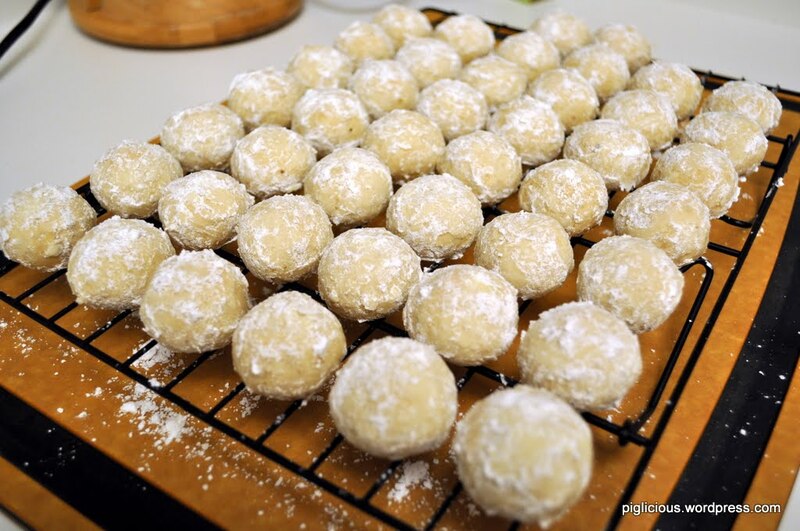 If you find that the sugar is melting way too much/too fast and your cookie no longer looks powdery, then I’d wait 5 more mins for the cookies to cool down a little more. Place the cookies on the wire racks and cool completely. 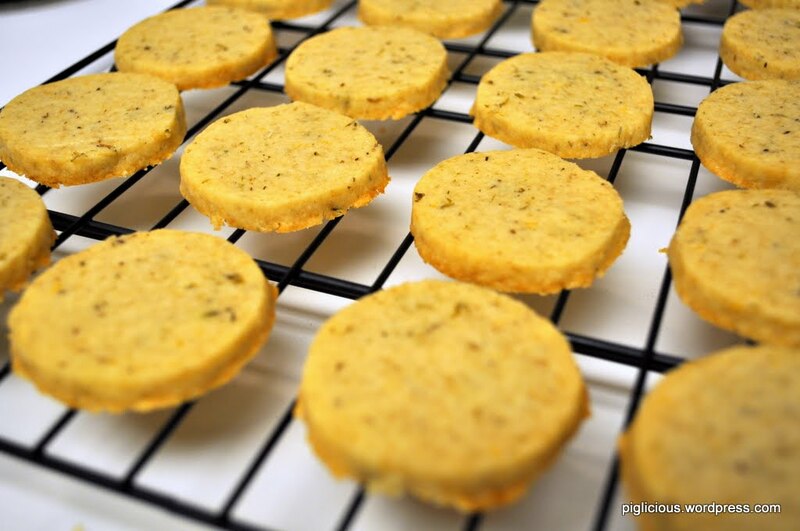 I made these in the evening and let them cool overnight and they tasted so much better the next day. Store in airtight tupperware and they could sustain their freshness for a week. 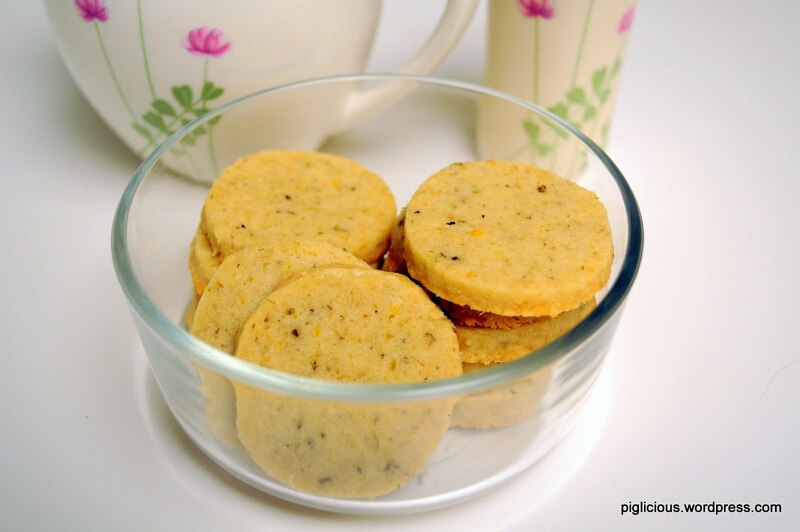 These butter cookies are a great complement with tea or coffee! I found this recipe and semi-followed it. Tweaked it a little, to my liking. *The brown sugar to confectioner’s sugar ratio is 1:1. 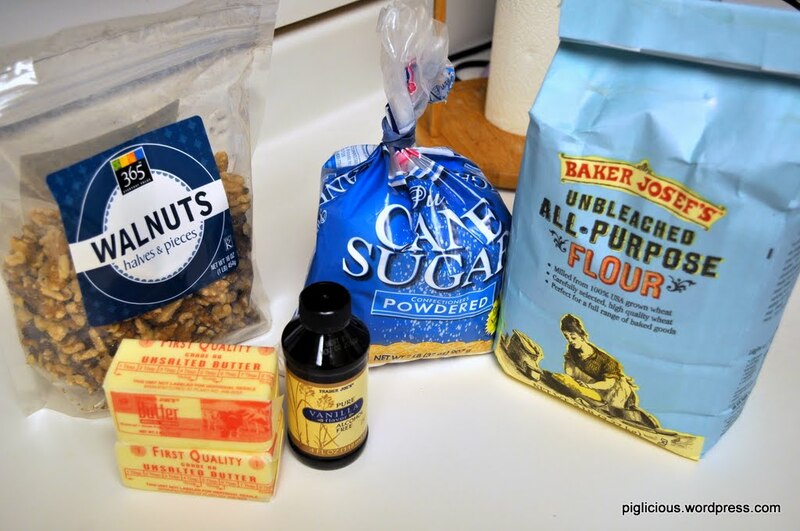 I use a little more than 1/8 and a little less than 1/4 cup for the brown and confectioner’s sugar. I came about this odd amount because when I made it the first time with 1/4 cup, I found it a little too sweet for my liking. Then I made it with 1/8 cup and it wasn’t quite sweet enough. 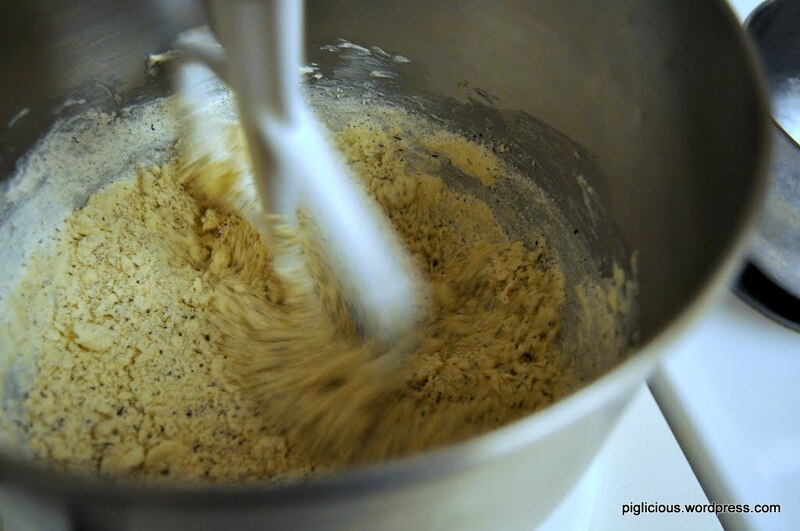 In a medium mixing bowl, mix the dry ingredients (flour, sugars, salt, tea) together with a spatula. 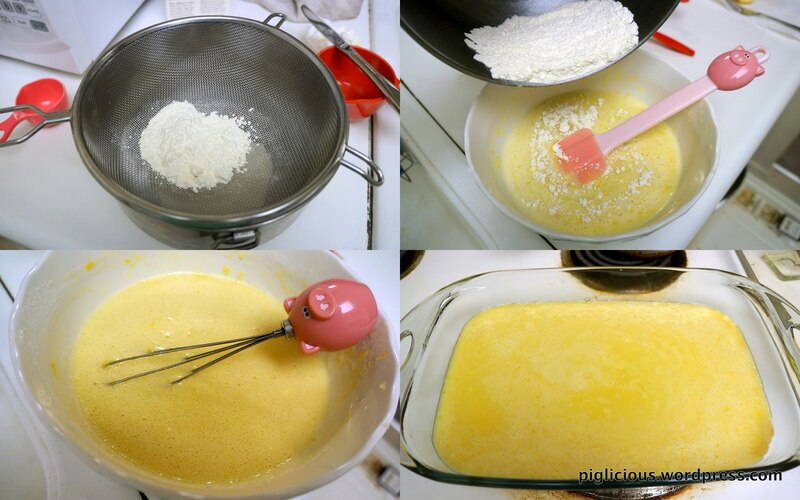 Make sure to smooth out any sugar clumps and mix evenly. Add the dry ingredients to the wet. Mix at low speed (level 1/2) for a few minutes. Then turn it up to low medium (level 2/3) for a couple of minutes. Stop occasionally to make sure everything stuck at the bottom and on the spatula is mixed in. Once it looks like the picture below, you can stop. Use your hand and press all the little clumps together to form a mound. 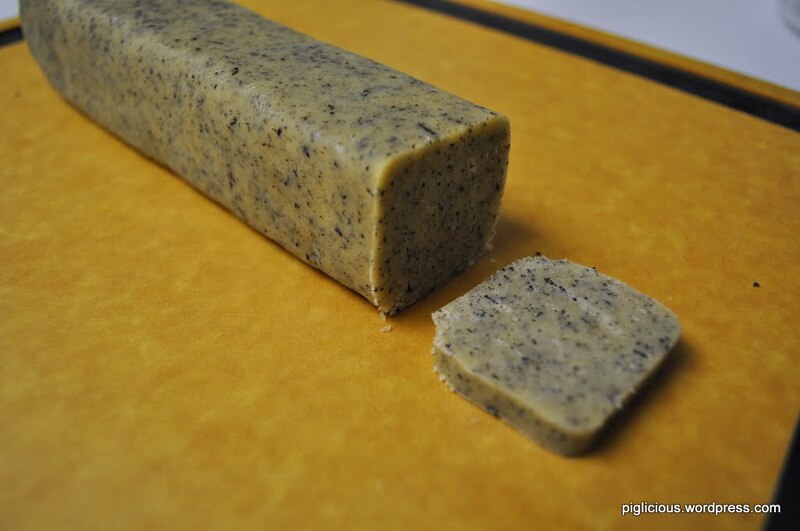 Take it out of the mixing bowl and mold it into a packed rectangular log. Feel free to slap/pound it a little to pack it together well. Slice cross section pieces that are about 1/3 inch thick. 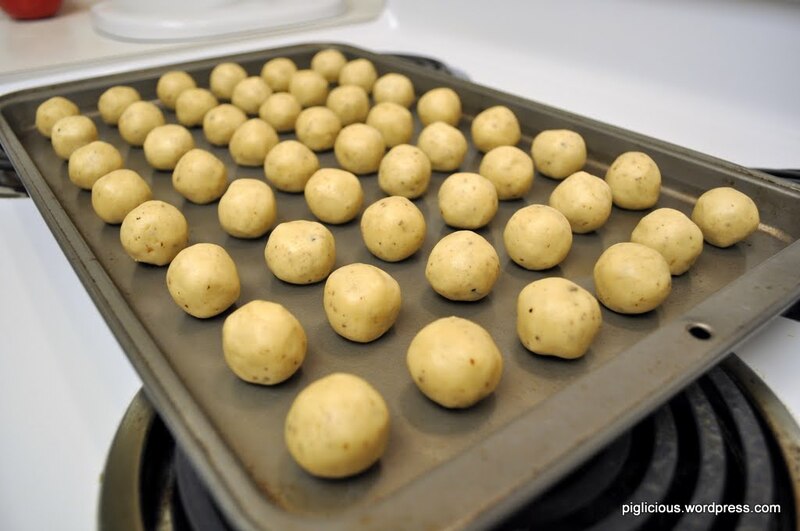 Bake for 8-10 mins or until the bottom edges are light brown. Let it cool for 5 mins. 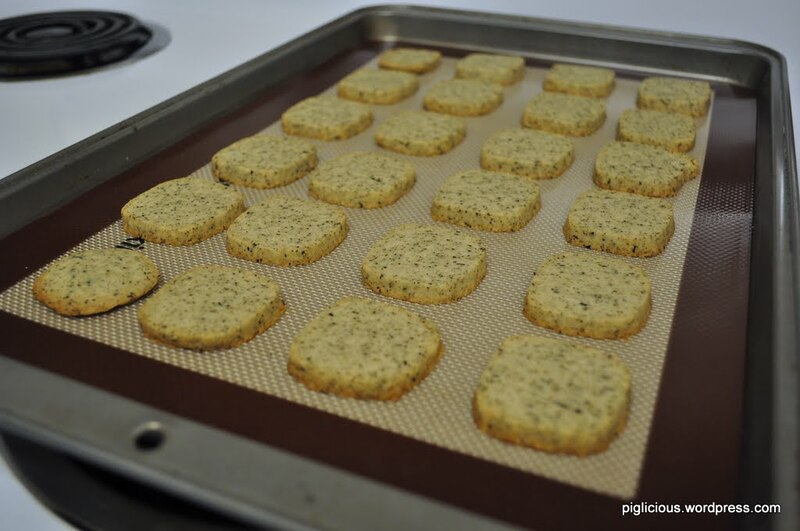 Remove the cookies from the silpat and place them on a cooling rack for 20 mins. They’re now ready to be enjoyed–They’re so addicting.